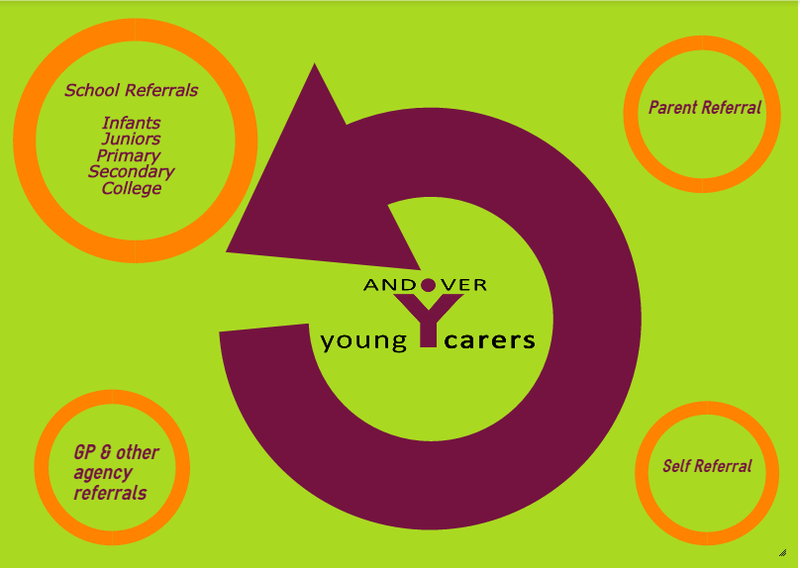 Referrals come into Andover Young Carers in many ways. A child may be referred by a school, who, after chatting to the parents thinks that the child may benefit from some support from our service. A parent may directly refer, or indeed an older young person may hear of us in school, or see the posters or website and contact us for more information. However, when a child is referred the initial assessment process is the same, following a chat with the parents or carers, an assessment will be carried out, and if the young person is identified as a young carer a discussion will take place on the most appropriate support. Potential young carers can also be referred by other organisations, as part of a whole family support package. To reside in the Andover area or surrounding villages. To meet the definition of a young carer based on an individual assessment of need. At present we accept referrals made by professionals, such as doctors, educational psychologists, health visitors, CAMHS, schools, etc. However, if you are a Young Carer, a parent or a sibling of a Young Carer, please contact us and we will follow up, contacting all relevant agencies to help with the referral process.